Hi everyone! Happy New Year! I hope you all have an incredible 2016! 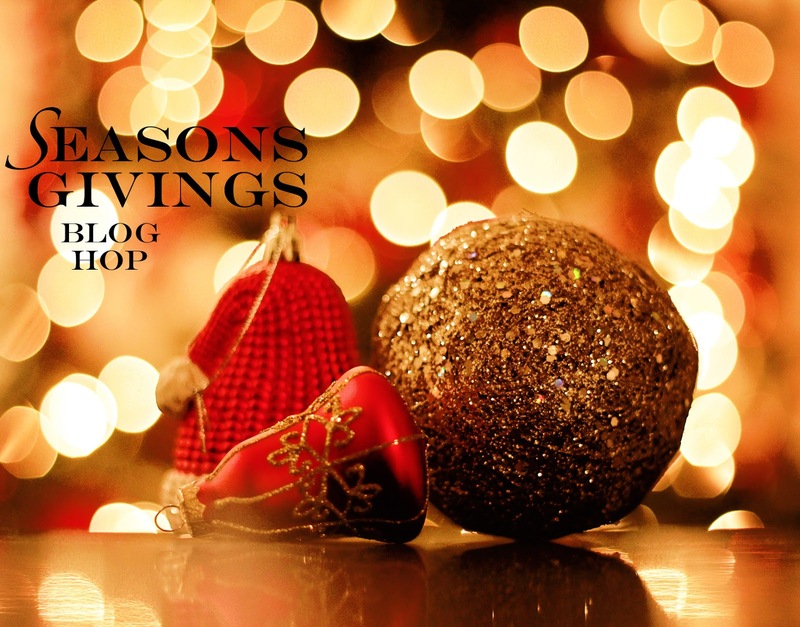 I am so excited to be participating in the Seasons Givings Blog Hop this year! One lucky commenters on my post today will win a $50 Gift Certificate to my favorite store…My Favorite Things! You have until Wednesday January 6, 2015 at 11:59PM PST to comment and I will choose the winner on Thursday, January 7 and announce the winner here on my blog! Grab a hot beverage and enjoy a leisurely stroll through these incredible blogs. Good luck everyone, I hope you all win something fabulous on the blog hop! A special thanks to Latisha for putting this hop together. Love this hop, and wow on the MFT gift card--looking forward to the new MFT release too! Happy New year! Thanks for this chance. Thanks Julie. I love MFT! Happy New Year! Thanks too for your giveaway....awesome prize. Happy New Year, Jules! Tell the whole MFT I said hello! Thanks for all you do! Best wishes for a prosperous 2016! Happy New Year! Love the inspiration and grateful for the opportunity to win MFT products (love them!!! - great new release). Wow what a fabulous giveaway! Happy New Year! Great giveaway!! Happy New Year! I love your work and thank you for sharing your creativity to inspire us all! I posted some of my favorite cards from my design team work on my blog (http://afourthlife.blogspot.com) as well. Thanks for a chance to win! Thank you for the chance to win a fab $50 gift cert to MFT shop! Ooh - I love spending money at MFT - thanks for the chance to win!! I love MFT products - thanks for sharing your crafty goodness and Happy New Year! Oops... Had a major typo! Love MFT! Thanks for the inspiration! Happy New Year! My Favorite Things has a LOT of MY favorite things. Thanks for the generous prize. MFT is one of my very favorite companies! Thanks for the chance to win such a generous prize. Happy New Year! Happy New Year, thanks for the great giveaway. My word of the year is -PEACE-. Love your blog and wow what a generous prize that is! Thanks. Happy new year! Happy New Year! MFT is my absolute favorite. Thanks for the chance to win. Happy New Year!!! My best wishes to you for a happy and crafty 2016!!! Thank you for offering this generous prize! wow!! what a fabulous prize. Happy New Year to you! This is such a fabulous blog hop...thanks for the chance to win! Happy New Year. Fabulous prize, thanks for the chance to win. My MFT wish list is long (I know I am not alone in that)! This is such an amazingly generous blog hop! I can't believe all the amazing talent I get to see! Thanks for the chance to win! Generous prize package! Thank you for providing inspiration all year long! Best to you in 2016! Thanks for the chance to win such a wonderful prize!! Happy New Year to you and your family! What an awesome blog hop! Thanks for the chance to win! One of my favorite things is My Favorite Things. Thanks for the chance to win. Love your tags, and I agree you can never have enough ink or paper, I hoard my paper, lol. I love this hop, its like Christmas, you know it's coming and you can't wait for it to get here everyone. So many amazingly talented crafty people all in one place. Thanks for inspiring throughout the years and the totally awesome prize. Thank for the opportunity to win! MFT is also my favorite store. I just bought a ton of goodies that I'll be playing with soon, but after just seeing Day 1 of the release, im just dying to get more now. eeks! Anyways, happy new year! Yummy MFT! Thanks for the chance to win some MFT moolah...I know I need more sweet images with coordinating dies! Fabulous prize!!! :) Thanks so much for the chance to win. Happy New Year!! Thanks so much for participating in this amazing blog hop and for the chance to win some wonderful goodies!! Huge gift. Thanks for the chance to win. Cant wait to check out all these blogs! Thanks to you talented ladies. Wow - that would be amazing! Thanx for this chance to win! Will have to hop around the other blogs, too! Happy New Year Julie! So great to get to know you through MFT! Oh, I love MFT! Thanks for a chance to win some wonderful goodies! I am about to run out of three of my favorite MFT cardstock colors, so this would be quite conveniently timed if I won! LOL! Happy New Year, Julie! Happy New Year! I hope 2016 brings lots of creativity and excitement for you! Loving this huge blog hop! Amazing blog hop. Thank you for your participation and generosity! Happy New Year! What a fun hop for New Years Day! Thanks for the giveaway! Loving this blog hop!! Thanks for sharing in the giveaway too! I just subscribed by email and would love it if I won too! But I am sure your emails with your blog posts will be most inspiring to me. Hi Julie, thanks for the generous offering. Just curious though on you draw date.... Your date doesn't match the new calendar for 2016. Not sure if you noticed this or not??? Thanks again for the chance to win. Happy New Year! Great way to start off the year. I love MFT and would love to win the prize. Thanks for a great giveaway! I appreciate you sharing your creativity. Fantastic prize. Wonderful hop. Always enjoy your inspirations. Thank you. Thank you for your giving spirit. It would be so perfect to win this gift card to my favorite store on January 9. That's my birthday. Fantastic giveaway - thanks! MFT is one of my faves, too! Happy New Year! Great giveaway, thank you and happy new year. Thanks for an AWESOME prize! Have a warm and crafty 2016! Thank you for a chance to win this great prize ! Happy, creative New Year ! What a generous giveaway you're offering! Thank you for the opportunity to win and have a Happy New Year! Awesome blog. So many fun goodies. MFT is the best. What an amazing giveaway! Thank you for the chance to win!!! Happpy New Year! Woozers amazing giveaway. Thank you for the chance to win. beautiful work. MFT is one of my favorite stores, too! Wonderfully generous giveaway! Happy New year and thank you for the chance to win a gift card to MFT! Wow... that's an awesome shopping spree! Great blog hop! Thank you for the chance to win! Love MFT! Thanks......love your cards! cool, one of my favorite things is MFT! Looove MFT designs so would be thrilled to win this giveaway. Thanks and happy new year. Have a happy new year!! !That is an awesome prize! Yeah! My Favourite Things is my favourite!! Lol! Great blog and your cards are wonderful! Thanks for sharing! This hop is amazing!! Thank you! And MFT-WOW! I love MFT and have lots of stamp sets from there. Hello Julie! It's been awhile since I have been able to stop and visit! I always enjoy seeing what you create and as a matter of fact I am going to halt my New year's hop and check out this month's MFT release! Wishing you a very Happy New Year! Awesome giveaway! Wishing you a Happy Happy 2016! What a generous giveaway! Happy New Years! I love MFT. I love your work. WOW!! What a generous prize! Thank you for the chance to win! Happy New Year and thank you for all the inspiration and the chance to win! Thanks for all your inspiration in 2015! I love your work! Happy New Year!! Thanks for the inspiration!! Happy New Year 2016!! Thanks for the opportunity to win a prize to my favorite store too. Happy New Year!! Thank you for all your inspiration!! Thanks for the opportunity to win!! So excited!!! Happy New Year! Thanks for all your inspiration this past year! Thanks also for a chance to win an awesome prize! Wishing you a happy and blessed 2016! Love seeing your posts on MFT's pages. thanks for the offer of a wonderful gift. This is my first time to your blog, but not the last! Love the post above this made with MFTs new releases. Happy New Year! Thanks for participating in this fun hop! Love your work, Julie, and love MFT! Thanks for the chance at such a generous prize! WOW! What an awesome giveaway! Just in time for the fabulous new release - LOVE seeing all the sneak peeks! Those sheep are at the top of my wish list right now - my mom collects sheep! What a gorgeous card!! hank you for a chance to win and Happy New Year! Happy new year! Thanks for a chance. Have my hot beverage and sitting back, hoping to win your prize! I love blog hops and this one is great. It is a little long though. I have been hopping for 2 days now. Love MFT--thanks for the chance. I love doing this hop each year!! I have met many new friends along the way! Happy new Year!! Happy New Year! Great giveaway! Thanks for the chance to win. Many blessings for the new year! So many great stops along this blog hop! Thanks for the opportunity to win such a wonderful prize. Best wishes to you for a very happy 2016! Happy New Year!! Thanks for the chance to win. I'm so glad I found this hop this year. Love your work. Thanks for the chance to win. Love MFT. Have a Happy New Year. Such an awesome hop! I look forward to it each year! A great opportunity to pop in and say hi and thank you for the chance to win a great prize! I love MFT, so your gift card is an awesome choice for a prize! Thanks for a chance to win such a generous gift! Happy New Year! Wish you a great 2016. Thanks for the generous gift. Keeping my fingers crossed since MFT is one of my favourites as well! Wishing you a wonderful 2016!Thanks so much the the MFT chance to win. Happy 2016! Great blog hop! Your blog is fantasctic. Thanks for the great gift offer and the chance to win. Happy New Year! Happy New Year, thanks for being part of this awesome blog hope! Awesome prize! I look forward to seeing your posts in 2016. Happy New Year! Thank for such a generous prize. They are one of my fave companies. Happy new year to you. Thanks for the fabulous giveaway! I'm a big fan of MFT. Happy New Year! This blog hop is the best! Happy New Year. Love your cards! Thank you for this opportunity! Oohhh! LOVE MFT! Thanks so much!! I am a MFT addict! Thanks for the chance at a gift certificate. Always LOVE your cards! thanks for the chance! I am loving the MFT sneak peeks and a GC would be awesome!!! Thanks for offering the prize (I love MFT!!) and all the best in 2016! I love your creations! Thanks for participating! Amazing projects and generous give away! I will be following! MFT, one of my favs! Thx for a chance to win this generous prize! Happy 2016! MFT is one of my favourite stores too! Happy New Year Julie! Love your creations and MFT. Thanks for the chance to win an amazing giveaway. Giveaways! Great way to stay within my crafting budget. I am excited for the MFT release! Thank you for offering such a great MFT gift! I have seen a lot of your creations as a MFT addict! Your creations are inspiring! Have a Happy New Year! Love your work and can't wait to see more in 2016. Thank you so much for the chance at such a great prize, gotta love MFT. I really like MFT products and have several myself. Thank you for being part of this Awesome blog hop. I will be following you from now on. Happy New Year and much success to you in 2016. Love your work - always check out what you've made for the MFT blog! I just saw the more recent post. That wonky stitched rectangle has my name all over it! It looks like my sewing. Now you can see why I am not a quilter! Thanks so much for sharing, and for the wonderful prize! Happy New Year! Thank you for this amazing chance! I have enjoyed visiting your blog. Thanks so much for the opportunity to win this very generous prize (MFT is my favorite, too). Happy New Year! I love love love MFT stamps!! Thanks for being a part of this amazing blog hop, happy new year! I found you via the hop and now you're a shortcut on the desktop of my life! Great giveaway too! Your creations are wonderful! Thanks for being a part of this amazing (and HUGE) hop! Have a happy 2016! Happy New year. Fun way to start the year, with this hop! !